Skiing is not the only sport that you can enjoy on your hard-earned winter holiday. 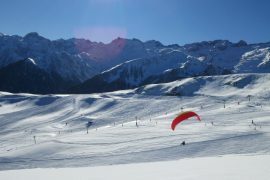 Here in the Pyrenees mountains we give you the opportunity to create your own actioned-packed winter adventure holiday incorporating a whole host of alternative snow-based activities. Many are sure to surprise you! 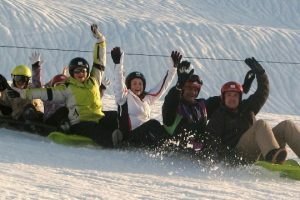 Whether you’re a family looking for a winter adventure holiday in France or a group of mates looking for a fun snowy time away together, this fully flexible and tailor made week of fun will tick all your boxes. 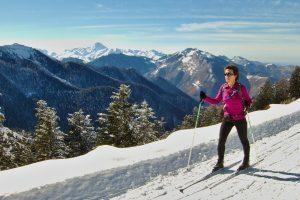 A week’s winter adventure holiday in the Pyrenees includes 9 activity points which you can exchange for an exciting variety of activities, creating a cocktail of fun for your week in the mountains. You can of course purchase extra points if you really want to have a non-stop winter adventure holiday! In addition to complete flexibility in the activities, we also give you complete flexibility when it comes to accommodation on this multi activity holiday. Self-catering properties and apartments, warm and welcoming bed and breakfasts or comfortable hotels, we have access to the full range of accommodation. Let us know your budget and the facilities you require and we’ll give you some personally selected options to choose from. 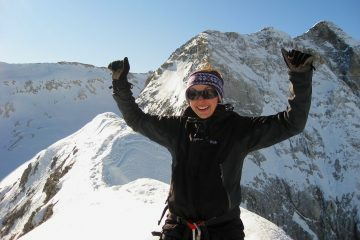 Once we have your activity choices we will create your own personal itinerary of snowy adventures. We’ll put everything in place so that you can enjoy all of the fun and none of the hassle. We’ll even come and meet you when you arrive to present your activity programme to you in person and answer any questions you may have. Then let your fun-packed winter adventures begin! Below is a summary of the activities you can take enjoy on this winter multi activity holiday, along with their respective points. You don’t need to choose your activities straight away. Take your time and let us know your choices 4 weeks before your holiday. You don’t even have to all choose the same activities. Pool your points and decide how you’d like to split them up between your family/group members. How’s that for flexibility! Airboard is a fantastic fun activity for groups of friends or families with active children. 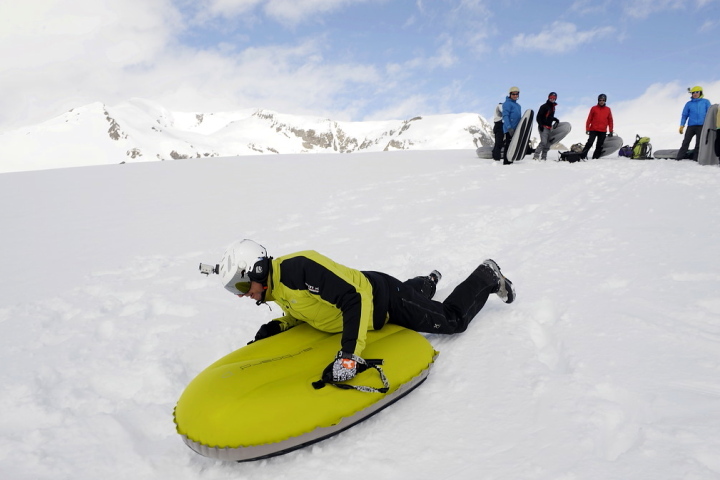 Lying face down on a kevlar coated inflatable cushion, descend the ski slope at whatever speed you choose. Hold on tight to the handles and use your bodyweight and feet to steer. Fantastic fun! Intro to Airboarding 1 Point The introduction to airboarding option consists of around 1h30 of fun on slopes that are closed to skiers either at the small but perfectly formed Le Mourtis ski station or at the Peyragudes resort. At le Mourtis, even more spice can be added to the activity with mini slalom challenges and jumps too. Airboarding is open to children from 7 years of age. 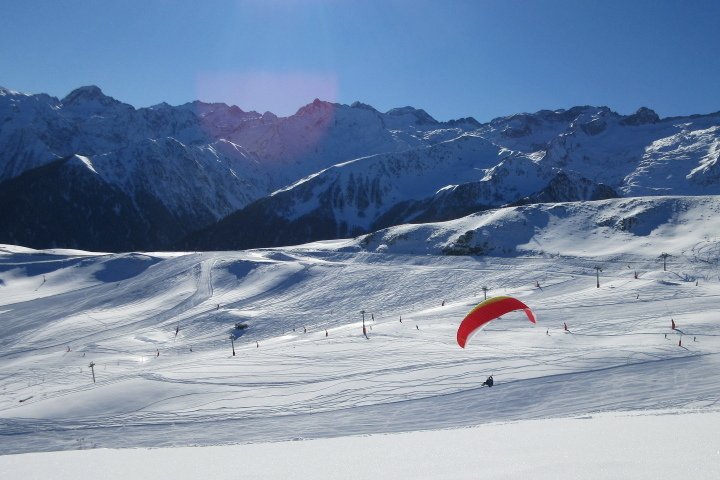 Full Ski Slope Airboard Descent 1 Point At the le Mourtis ski station, adults and children over the age of 12 who have already completed the introduction to airboarding session may enjoy a full descent of the resort with your instuctor once the slopes are closed to skiers. You’ll require a certain level of fitness and endurance, but what a spectacular way to round off the day! Cross country or XC skiing is known as ski nordique in France. You wear short supple ski boots of which just the toe clips into the skinny skis. The heel remains free as you ski. With the classic style of XC skiing you ski in pisted tracks whereas the skating style can be a full-on cardio workout. A brilliant cross-training activity for sports requiring strong cardiac skills. Freeride airboard is a physically demanding alternative winter sport for the fit sporting enthusiast wanting a change from skiing. In the company of an expert guide, you’ll snowshoe up to a high point near the Baqueira Beret ski resort before enjoying an action-packed and fun-filled descent on the airboard. Hold on tight! Freeride Airboard 2.5 Points On this full day outing (suitable for adults and fit children over the age of 14 yrs), your guide will accompany you on the 750m snowshoe climb up a hillside near the Baqueira Beret ski resort. 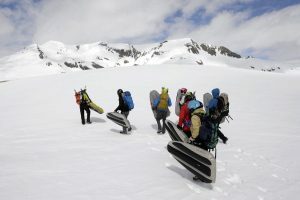 After your packed lunch you’ll pack away the snowshoes in your rucksack (you’ll need to provide your own), have a comprehensive briefing on how to handle the airboard and then the fun descent back down the hillside can begin. The descent will take up to 2h. 1/2 Day Freeride Airboard 2 points The 1/2 day option is better suited to fit children under the age of 14 years and includes 500m of ascent on the snowshoes. 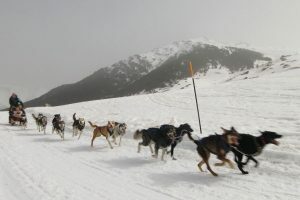 Husky dog sledding in the Pyrenees is a fun and unique way to enjoy the beauty of the mountains in winter. Take it easy in the sledge or drive your own small team of huskies! Huskie sledding captures the imagination of children. 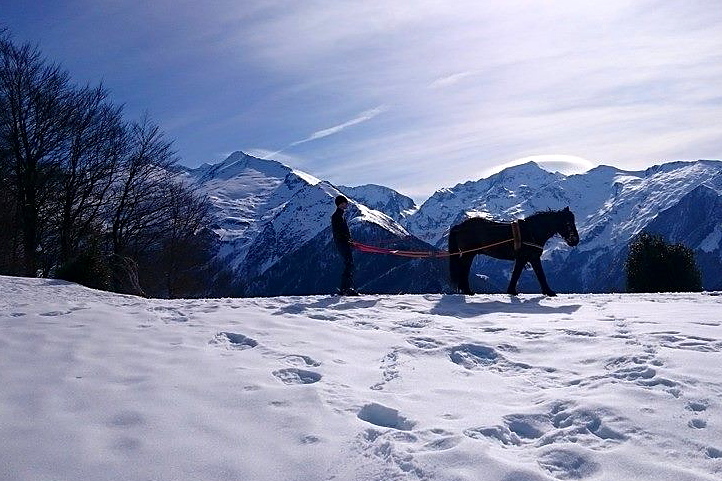 Adult 20 Mins Husky Dog Sledding 2.5 Points On a sled pulled by a team of 12 dogs, you will cross the frozen river, leaving the Baqueira Beret ski resort behind and drive to the entrance of the stunning Dossau forest. The trip covers 3.5 km and takes around 20 mins. Intro to Driving Huskies 5 Points Learn to drive huskies in this 1 hour fun-filled session with the musher. 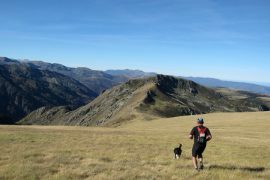 You’ll receive a brief training course and introduction to mushing from the expert guides followed by a trip in the Beret area near the Baqueira ski resort. Ice climbing in the French Pyrenees provides a mental and physical challenge in a beautiful winter environment. 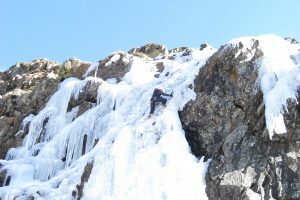 Ice climbing is naturally very much conditions dependant so is often booked as a last minute activity. 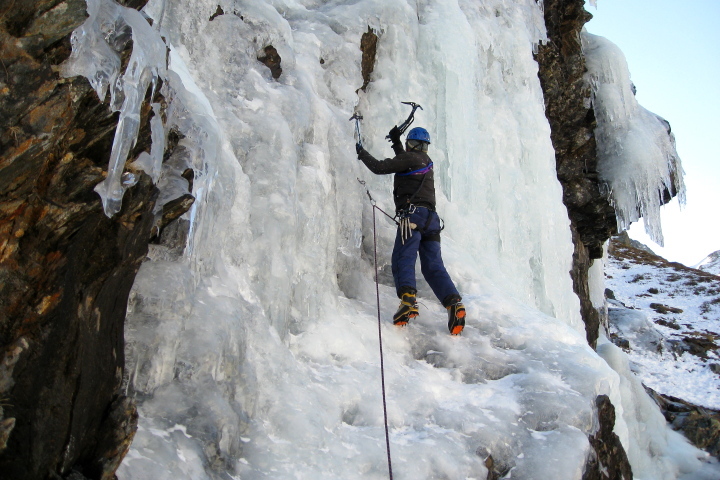 Your expert guide will teach you how to safely progress up the ice fall using your ice axe and crampons. A good workout is guaranteed! Guided Ice Climbing 4 Points Based on a minimum of 4 people in the group (not necessarily your own group), you will be intiated into the art of ice climbing in the company of an experienced and qualified high mountain guide.The venue will depend on which waterfalls are in condition and the outing will include either a reasonable walk-in (1-2 hours) or a min 1 hour drive. Once you are kitted out with helmet, harness, ice axe and crampons you will receive instruction on the techniques required to make your way up a frozen waterfall. Building an igloo is fab fun for all the family. There’s a certain technique to it which your guide will show you. You’ll cut slabs of snow which you’ll use to create the walls and roof of your igloo. Once you’ve laid that last slab of snow on the roof, stand back and admire your handywork! 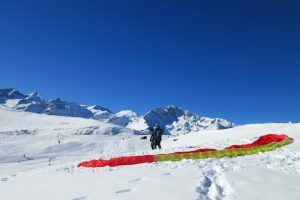 With a small pulk in tow, fully supplied with yummy goodies (chocolate, fruit, cake, drinks and a rug to sit on), you’ll depart with snowshoes on your feet to explore a snowy winter wonderland. At a designated place you’ll stop for a break to prepare your own delicious chocolate fondue with the family! Yum! Pulk and Choc Fondue Experience 1 Points This activity is open to all ages. Snowshoes are available for children as young as 6 years and you’ll only be snowshoeing for around 1 hour. This is an afternoon activity which takes place around the little le Mourtis ski station. You’ll be provided with details for your snowshoeing route so don’t worry about heading out on your own. You won’t get lost! 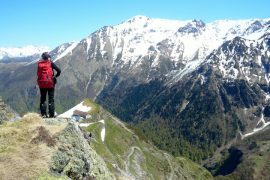 Rock climbing in the Pyrenees is a year round activity which takes place down in the valleys which are often snow-free in the winter. 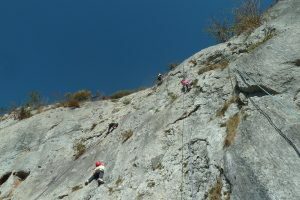 In the company of an expert guide, first-timers will learn belaying techniques as well as how to move safely up the rock using just the natural hand and foot holds. Guided Rock Climbing 2 Points Based on a group of 4 people or more, this 1/2 day guided rock climbing experience is a great introduction to the sport. You’ll learn all about the equipment needed to climb up a rock face and how to tie the specific knots that will attach the rope to your harness. Your guide will then belay you as you make your way up the warm rock face, using natural hand and foot holds in the rock. You’ll get a real sense of achievement when you reach the top and your guide lowers you down using the rope! 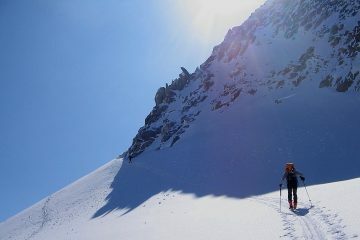 Ski touring is a sport open to any skier who is comfortable skiing in all conditions. 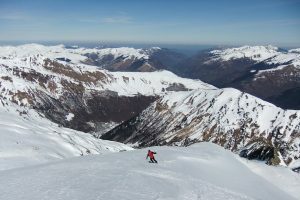 As a change from DH resort skiing, let an experienced local guide take you into the wild and beautiful back country for an unforgettable skiing experience. If you’ve never ski toured before, our introduction to ski touring experience is a great way to learn the basics. Introduction to Ski Touring 6.5 Points If you’re over 15 years and are confident skiing in all conditions and are interested in taking the first steps towards exploring the backcountry, the area around the le Mourtis ski resort provides the perfect, safe environment for learning the basic. 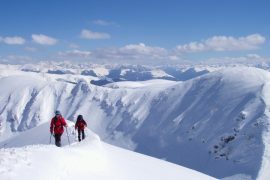 On this full day and before heading out, your expert high mountain guide will teach you how to use essential safety equipment such as the Arva, probe and shovel. Next, you’ll learn the technique for skinning up the slopes and discover just how physically demanding this activity can be. Then comes the fun part as you remove the skins from your skis and tackle that fun off-piste descent. Put some of your activity points towards a day or two on the slopes of one of the local ski stations. 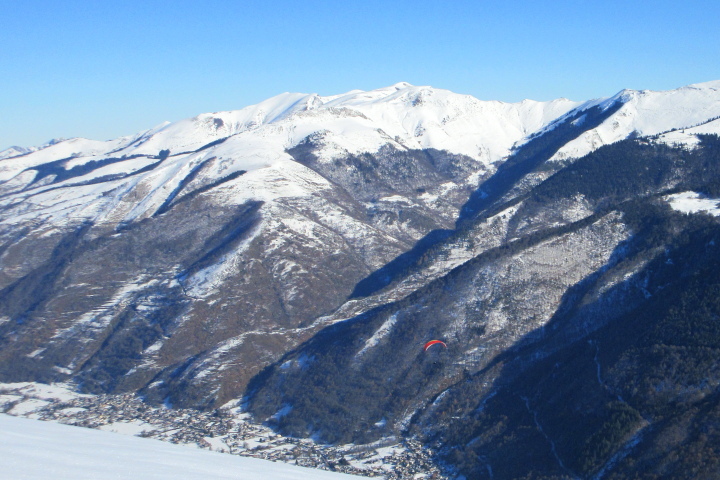 The resorts of Luchon Superbagneres, le Mourtis and Peyragudes are family friendly and with runs for all abilities. Lift Pass & Equipment Hire Peyragudes 6.5 Points The 2 day lift pass gives you access to the extensive network of slopes on both sides of the Peyragudes ski resort. 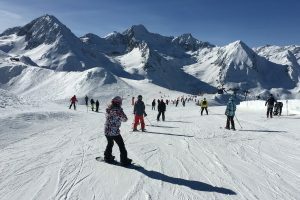 Lift pass & Equipment Hire le Mourtis 2 Points The small and very family friendly le Mourtis ski resort is great value for a family day on the slopes. 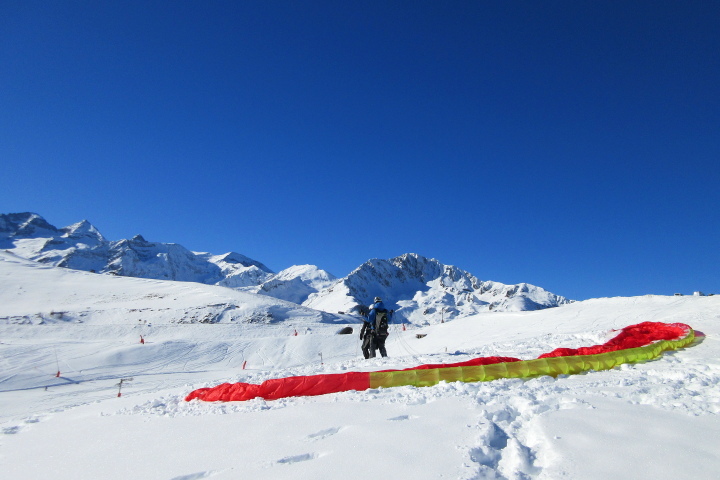 A fantastic fun winter activity for all the family on the slopes of the Peyragudes or Superbagneres ski resorts. This is a rollercoaster ride in which a series of up to 10 sledges are connected together to form a snake sledge. You’ll hurtle down the slope with the people at the rear enjoying the most exciting ride. 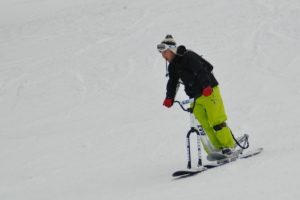 Snake Sledging 1 Point Join up to 12 individual sledges together with articulating joints, put yourself in the hands of the instuctor and enjoy an action-packed descent down the ski piste! The snow scooter is a fab fun alternative means by which to descend the ski slopes. It’s open to children over the age of 10 years as the scooter is easy to handle and stable once you get the hang of the technique. Snow Scooter 2.5 Points The 2h morning or afternoon snow scooter experience takes place at the little le Mourtis ski station and includes of course a briefing on how to handle the scooter. The points include a lift pass too. 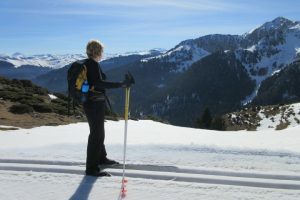 Snowshoeing, one of the best ways to explore the pristine winter wonderland of the Pyrenees mountains in winter. 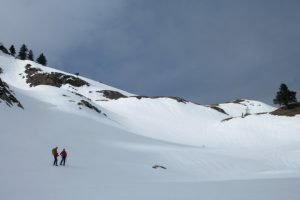 Your snowshoeing guide will take you off the beaten track, up into the mountains where you may see the tracks of some of the special Pyrenees wildlife. A grand day out for all. 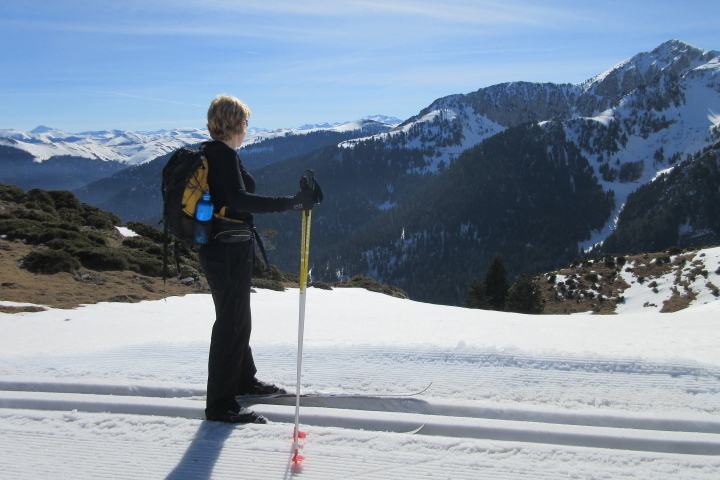 Guided Snowshoeing 2 Points This a great opportunity to explore off the beaten path and discover the stunning Pyrenees in winter conditions. Snowshoes and poles will be provided by your guide. The outing will be tailored to your ability. Points are based on 4 people. Treat the family to this unique and very special experience in a wild and unspoilt winter environment. With snowshoes on your feet you’ll make your way down a forest track to eventually emerge at an isolated mountain hut where you’ll be immersed in Nature. There, the experience will unfold in the company of an expert wilderness guide. 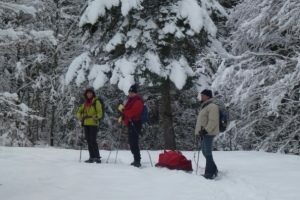 Points include snowshoe hire, hot lunch and guided activities. 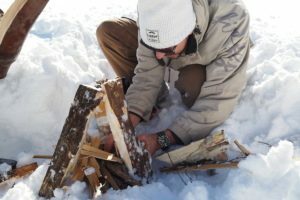 1 Day Wilderness Experience 1.5 Points Start the day with a self-guided 1.5h snowshoe to the hut where a hot drink awaits you. Then, you’ll enjoy an hour or so of wilderness activities such as making and starting a fire and then enjoy a comprehensive and filling hot lunch of local products cooked over an open fire. Evening Wilderness Experience 3 Points As this experience won’t end until maybe 23h00 it’s reserved for adults and older children. It follows the same formula as the day experience except it will be in the dark and accompanied by our local guide for safety reasons. Starting at 17h30 you’ll snowshoe down to the cabane using head torches to light your way. You’ll enjoy a 4 course meal cooked over the open fire with plenty of wine for the adults! Your return will be lit by flaming torches. Be sure to look out for deer and other wildlife that you may surprise along the way! Wilderness Full Monty 4 Points The full monty is a 24h-36h guided experience which includes all of the above plus spending the night under the stars in a tee-pee. You’ll sleep on camp beds and everything you need for a comfortable night will be provided. Lunch on the first day, the evening meal and also breakfast as well as drinks are all provided. 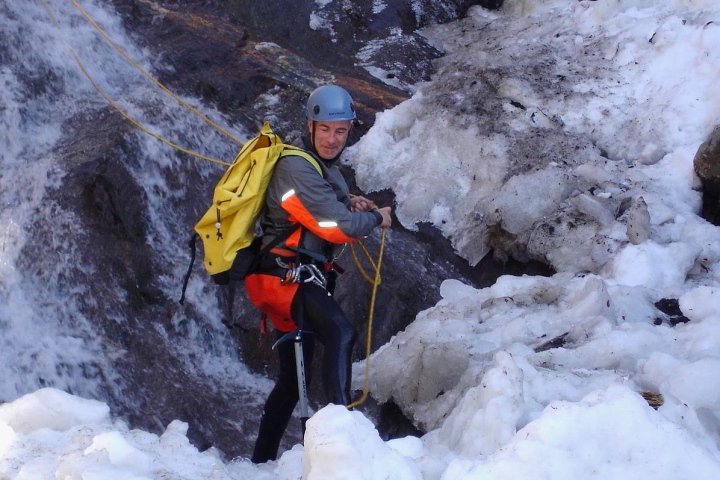 Experience canyoning in a winter environment from the comfort of an insulated dry suit. There’s nothing like it! 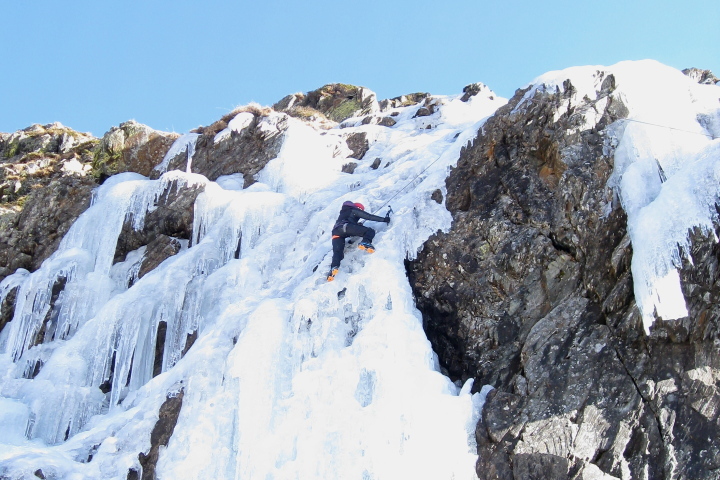 Jump into icy pools, slide down natural toboggans and abseil down waterfalls charged with snowmelt. 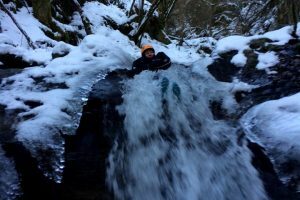 Winter canyoning is an exciting activity for anybody over the age of 15 years that’s looking for a unique experience on their winter holiday. Guided Winter Canyoning Descent 3 Points Descent of a level 2 canyon in winter conditions with all equipment provided. For safety reasons, winter canyoning outings are limited to 4 people. Mountain biking in the winter is fantastic fun on a fatbike! 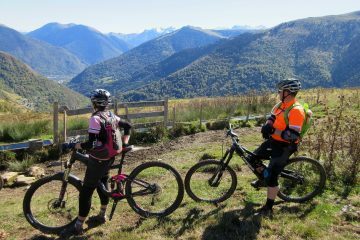 Explore the Pyrenees tracks and trails in the company of a local guide on these fun wide-tyred bikes. 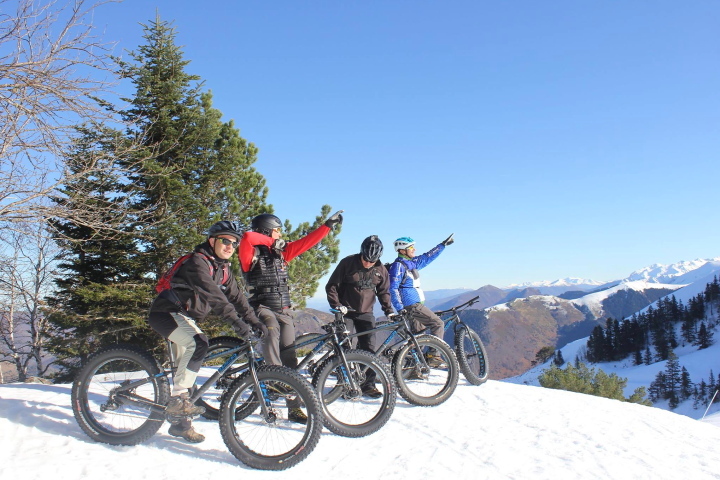 Take the uplift and have a fun guided fatbiking descent after the skiers have vacated the slopes at the end of the day. Fat Bike Hire 1 Point Fatbike hire (available for children as young as 8 years) along with GPS tracks, maps and advice on the local trails around the le Mourtis ski station. The routes range from gently undulating tracks to others that are more technical. Descend to the village of Boutx from where you can get a shuttle uplift back to the ski resort. Guided Fat Biking 3 Points Hire a fat bike for half a day and, in the company of an expert local guide, explore the tracks and trails that meander the hillsides around the Peyragudes and le Mourtis ski stations. Points includes bike hire and guide. 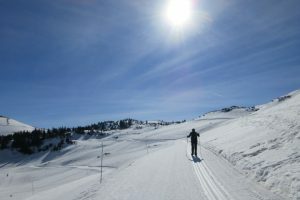 Fat Bike Ski Slope Descent and Bike Hire 2.5 Points At 16h30, once the lifts have closed at the little le Mourtis ski resort, your expert local guide will accompany you on a descent of the ski slopes on the fat bikes, from the top station all the way down to the bottom. The descent will be physically demanding and so is available to adults and children over 12 years of ages only. Night Time Guided Fat Bike Outing 2.5 Points Enjoy a meal at one of the great value restaurants at the le Mourtis ski resort and then, at around 20h30, let our local expert be your guide as you head out into the dark on your fat bikes. Head torches will be provided although the light of the moon reflecting off the snow may be all you need to see your way. The outing will last around 1h30 and is open to all over the age of 8 years. Points includes bike hire and guide. 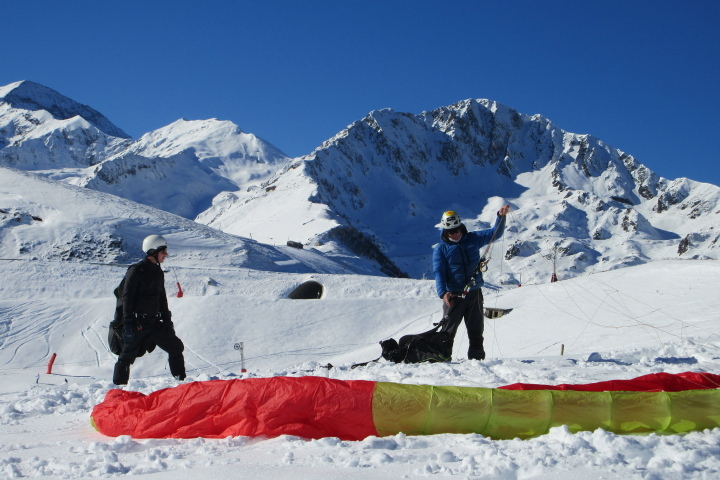 An amazing winter paragliding experience in the Pyrenees mountains around Luchon. 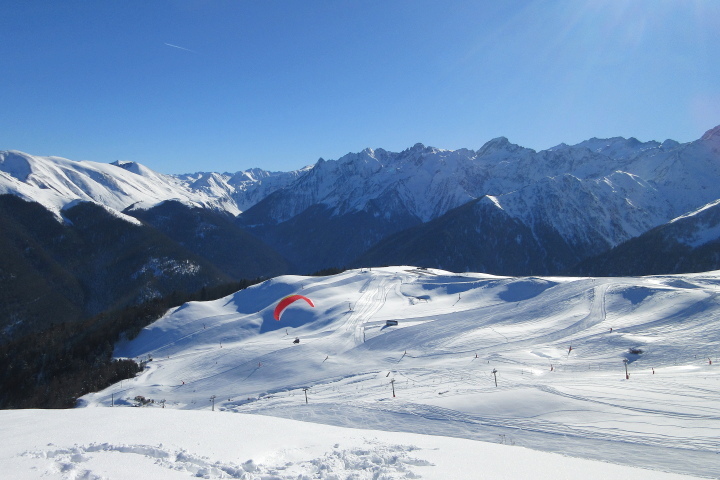 Be sure to wrap up warm for the jump from the Luchon Bagneres ski station with its spectacular views of the 3000m peaks. 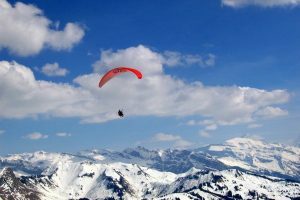 Tandem Paragliding 4 Points This 15-20 minute winter paragliding experience lifts off from the Luchon Superbagneres ski station and has to be one of the best ways to appreciate the stunning landscape of the Pyrenees mountains in winter. Having just returned from a winter multi activity holiday I feel I must write the first review. Being single it is difficult to do this kind of thing on your own but I have found the company who can deliver. It was made so easy for me. I was left to my own devices when I wanted to do so and the events/ideas were there when I wanted them. It has caputured the way people want to spend their holidays – tailored to exactly what they want, with enough adventure to add a bit of fright/thrill/fun but not too much to send you packing up and going home! 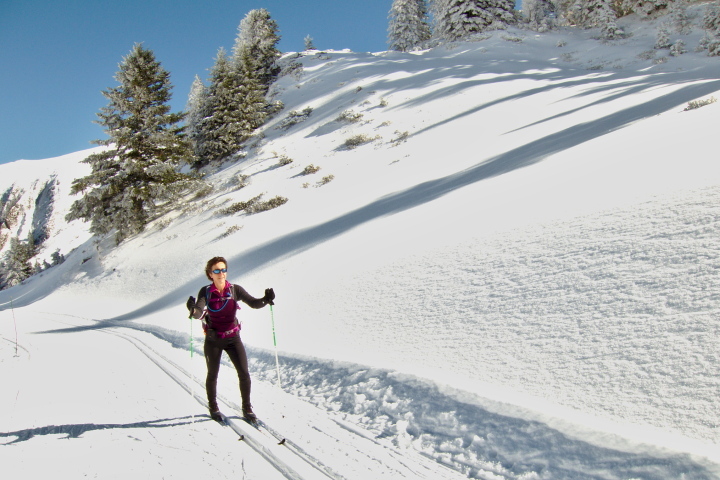 I partook of the XC skiing and snowshoeing the first day, found some breathtaking (and I mean breathtaking!) walks the others days and did an activity which has been on my bucket list – husky dog ride. Everyone should do that once in their lives! I could have also done the canyoning and mountain biking but couldn’t cram it all in. It’s a hidden gem and it really has got everything without the crowds to spoil the views. Highly recommend Adventure Creators to everyone with a spirit of adventure! !